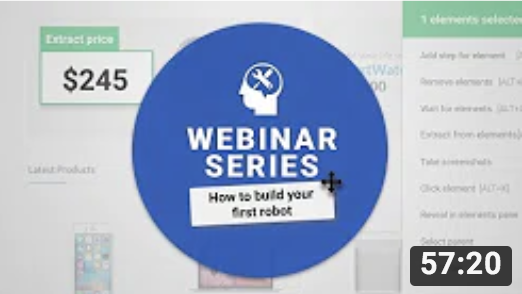 Fast track building and executing your first dexi.io robots by using these video tutorials and useful links to access our introductory materials. Still need help? Chat with one of our experts on Live Chat or Email. Dexi.io is an advanced, data automation and extraction software as a service that includes an easy to use visual editor for efficiently building and maintaining web scraping robots. For advanced automation, sourcing and data refinement use these links to learn about dexi.io’s advanced features and capabilities including; Dexi PIPES, API access, data transformations, integrations, processing, monitoring and alerts. 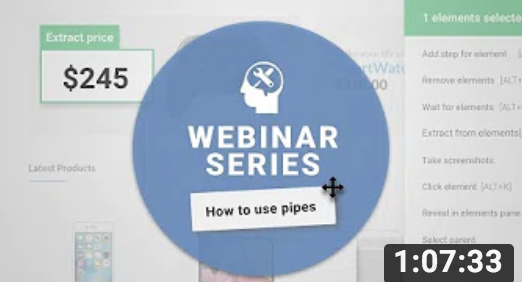 Webinar Series "How to use PIPES"
Having trouble building or executing your robot? Try these helpful links or visit our support page. Want one of experts to build it for you? Request a robot build here. Over a million dexi.io robots are being run every day for over 50,000 global clients to harvest and process critical data that keeps them one-step ahead. Our clients include major banks, retail brands, FMCG businesses, government departments and other leading firms. Here are some examples of how they are being used.